Why are RCD’s (or the similar GFI Ground Fault Interrupters) a necessary safety device? Previous Australian electrical safety measures have proven ineffective to prevent electrocution. These measures are: the earth ground cable in appliance and single phase wall wiring, and the standard fuses or circuit breakers in the switchboard/fusebox. A fuse is a low resistance two terminal series component that limits the current which can flow through it. When the current threshold is exceeded the metal filament in the fuse melts and breaks the connection, opening / disconnecting the circuit. This threshold is of course set above 10 Amps; the rated maximum for current carrying circuit in an Australian structure. However 10 Amps AC is much more than sufficient to be fatal if applied across the heart for a time of approximately 200 milliseconds (this time can vary due to the changing phase of the alternating supply relative to the phase of heart’s pumping cycle). The time it takes for a fuse to blow depends on the magnitude of the current spike; faster if larger and slower if smaller. But certainly longer than 200ms, and therefore always potentially fatal. Hence, fuses do not protect against electrocution. 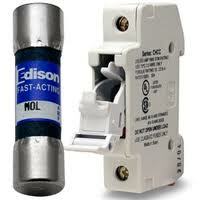 Circuit breakers act similarly to fuses except they don’t require replacement after being tripped. They also limit the current in a single circuit in most household applications. When excess of 10Amps is drawn through the switch this causes a heating effect on the bimetallic strip contained within, the expansion rates of the two metals are different and this causes it to bend and trip a spring-loaded switch. Three electrical connections are made to a standard appliance through a single phase power supply. The active wire (brown) carries an effective voltage of 230V (RMS @ 50Hz) to the appliance and the neutral wire (blue) serves as the common return path. The third wire (green yellow) is the electrical earth ground which is connected to the case of the appliance. 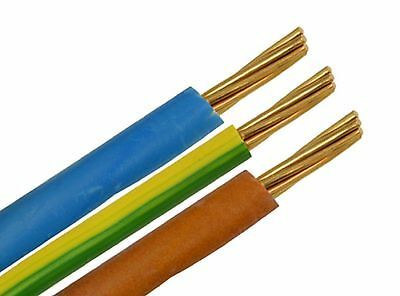 This redundant earth ground wire is a safety requirement for appliances and wiring systems in Australia. The term “earth ground” usually refers to a connection to the earth, which acts as a reservoir of charge. A ground wire provides a conducting path to the earth which is independent of the normal current-carrying path in an electrical appliance. Attached to the case of an appliance, it holds the voltage of the case at ground potential (usually taken as the zero of voltage). If the active (live) shorts to the case of the appliance, the 230 volt supply will be applied to the very low resistance path through the ground wire. This will cause an extremely high current to flow and will cause the breaker or fuse to interrupt the circuit. The earth ground line is routed to the electrical neutral at the switchboard (where it then is also physically grounded) to guarantee a low enough resistance path to trip the circuit breaker in case of an electrical fault. The fault current flows through the appliance ground wire to the switchboard where it joins the neutral path, flowing through the main neutral back to the center-tap of the service transformer. It then becomes part of the overall flow, driven by the service transformer as the electrical “pump”, which will produce a high enough fault current to trip the breaker. This process of tying the ground wire back to the neutral of the transformer is called “bonding”, for electrical safety you need to be both grounded and bonded. So the earth ground eliminates floating voltages; charge accumulating in an appliance/equipment that lifts its potential above the ground potential. A stored charge will discharge rapidly when a path to ground is established. The earth ground also eliminates shock hazard from a line short to the case/chasis. These are the common fault conditions, but these measures do not eliminate the possibility of electrocution. It is still quote possible for an uncaught fault condition (such as a direct short between neutral and active is established or active and earth) to occur and in this event, electrocution is unmitigated. That’s why an RCD is required for better protection against electrocution. Fig.1 shows a typical RCD circuit design for a single phase supply. 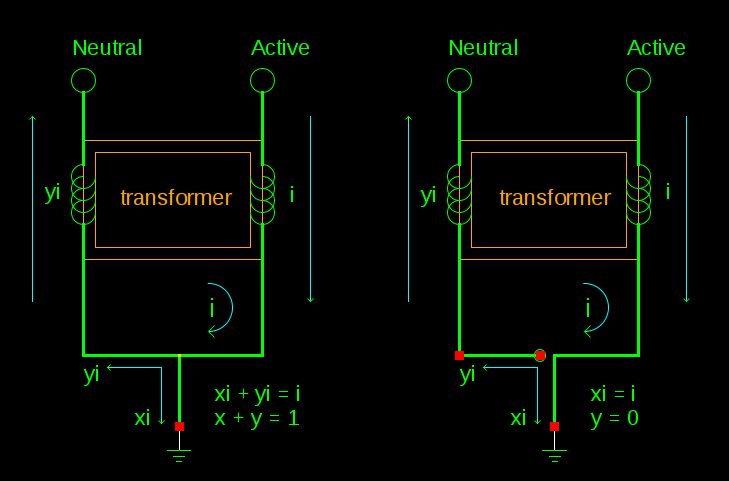 The active and neutral phase lines run through (or coil around) a transformer (or toroid) before flowing as usual through the load path. 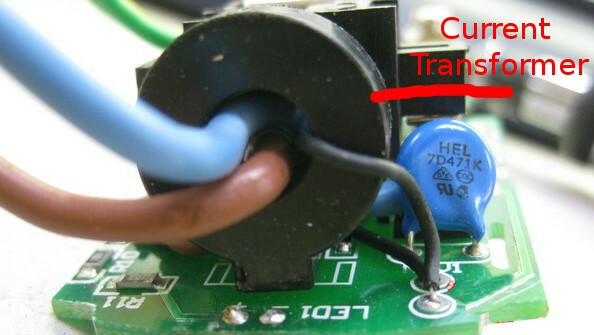 A third wire is magnetically connected to the transformer, this sensing wire (or coil) runs to a relay that physically actuates to disconnect the input lines. The earth ground line skips this step and behaves as it normally would in a single phase line wiring. Most modern RCD’s also have a test circuit built in to conveniently check that the RCD is working, activated by push button on the outside of the device. Fig.2 shows the normal operation of the circuit, where a closed path exists between the active and neutral wires through the load. Under these conditions the current in active wire is equal to the current in the neutral, which produces equal and opposite magnetic fields around these wires, resulting in zero net EMF induced in the transformer. 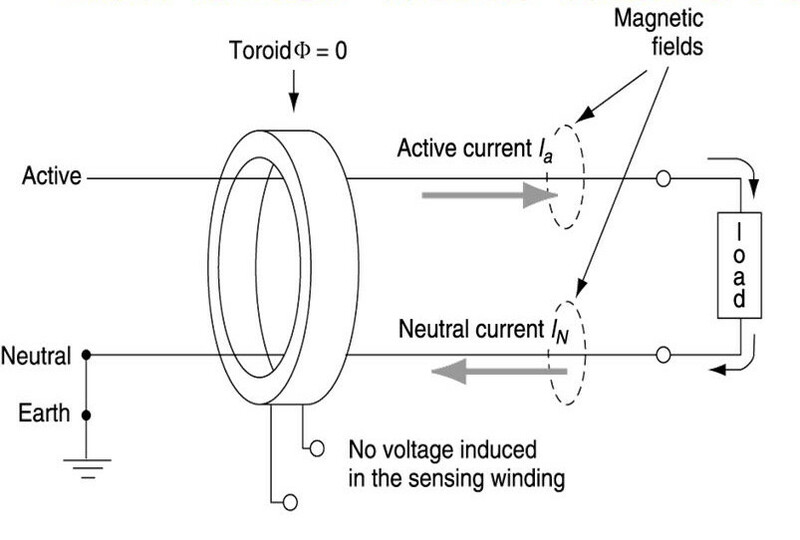 So therefore no voltage is induced in the sensor winding. Demonstrated in Fig.3 any current leakage to ground (or otherwise) out of the load path results in unbalanced operation of the circuit, yi ≠ i. In this situation, unbalanced magnetic fields are produced by the active and neutral wires. This immediately induces an EMF in the transformer. The resultant non zero electro magnetic field immediately induces a voltage in the sensor wire and produces a current flow. 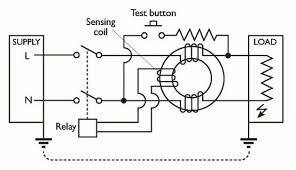 The sensing wire is directly connected to a relay (or other fast electromechanical switching mechanism), when the sensitivity threshold of the relay is met the relay triggers and mechanically disconnects the power circuit very quickly. A relatively small current of 30mA applied across the human heart for a period as short as 40ms is potentially sufficient (depending on the phase of the AC wave) to cause ventricular fibrillation leading to cardiac arrest. The response time and sensitivity of the residual current device are designed to meet or exceed these requirements. The incoming supply and the neutral conductors are connected to the terminals at (1), and the outgoing load conductors are connected to the terminals at (2). The earth conductor (not shown) is connected through from supply to load uninterrupted. When the reset button (3) is pressed, the contacts ((4) and another, hidden behind (5)) close, allowing current to pass. The solenoid (5) keeps the contacts closed when the reset button is released. The sense coil (6) is a differential current transformer which surrounds (but is not electrically connected to) the live and neutral conductors. A current in the sense coil (6), is detected by the sense circuitry (7). The sense circuitry then removes power from the solenoid (5), and the contacts (4) are forced apart by a spring, cutting off the electricity supply to the appliance. The device is designed so that the current is interrupted in milliseconds. The test button (8) allows the correct operation of the device to be verified by passing a small current through the orange test wire (9). This simulates a fault by creating an imbalance in the sense coil. The images below show a portable RCD that plugs into a wall socket or outlet. 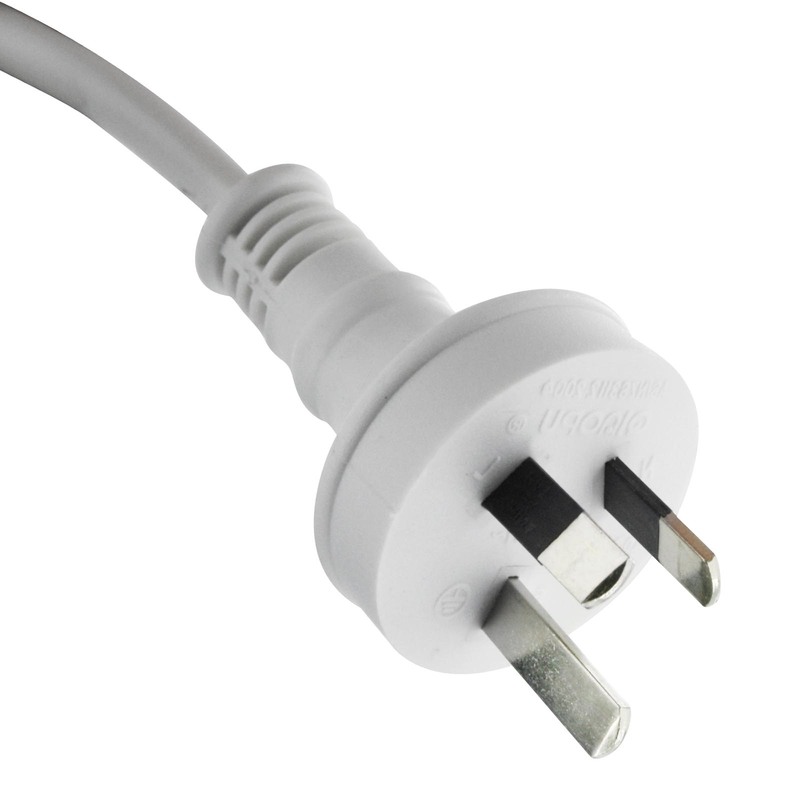 These portable devices can be plugged into any standard Australian wall socket, the appliance power cord is then plugged into the RCD. 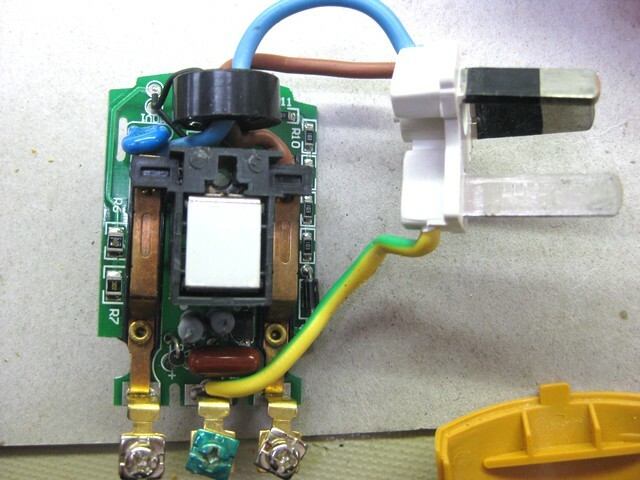 Major differences exist regarding the manner in which an RCD will act to disconnect the power to a circuit or appliance. Two differing nomenclatures are in use to identify what is essentially the main feature; either ‘Active’ or ‘Passive’, and ‘Latched’ or ‘non-Latching’. All RCDs have a latching feature. The latch becomes set when the device is armed – typically by moving a switch to the on position, or depressing a reset button. Once armed, the device permits power to flow until some electrical event occurs that causes the latch to become un-set. That trigger is normally intended to be the detection of a serious electrical irregularity, but un-latching can also occur by the disconnection of the power; such power-disconnection is not regarded as an irregular event, and includes such events as a user disconnecting the power intentionally or unintentionally, or a temporary power failure attributed to the electricity service provider. ‘Active’ RCDs operate to un-latch themselves when any irregular power event occurs, and that includes any simple power-disconnection caused by any means whatsoever; no automatic re-connection operation follows the cessation of whatever caused the RCD to be triggered; the power to the circuit or appliance will remain disconnected until the RCD has been manually reset by the user. ‘Passive’ RCDs operate to un-latch themselves solely when the power irregularity appears to be a serious electrical fault. However, except where the power has been disconnected by the RCD un-latching itself (or by the user manually triggering the device), the RCD will remain latched throughout any period when the power is not connected, and remain latched and ready to continue usage in its armed mode as soon as the power supply is restored. RCDs installed as fixed devices within a consumer power distribution unit are almost always of the passive variety, so that household appliances such as refrigerators and freezers will return to their regular mode of operation as soon as the power supply resumes normal operation. RCDs of a portable type are mostly of the active variety, and all trigger events will cause them to un-latch the settings – specifically to avoid power resumption when the power supply previously disconnected by the RCD itself is restored. This type of action is particularly desirable with appliances such as power tools and garden machinery that could become dangerous if they were re-activated without personal supervision. Such portable RCD types are generally active types of either a plug-top design intended to be hard-wired to an individual appliance, or as plug-in units to fit between an appliance plug and a wall-socket, or built-in to extension cables. The number of poles represents the number of conductors that are interrupted when a fault condition occurs. RCDs used on single-phase AC supplies (two current paths), such as domestic power, are usually one or two pole designs. A single-pole RCD interrupts only the energised conductor (active), while a double-pole RCD interrupts both the energised and return (neutral) conductors. In a single-pole RCD, the return conductor is usually anticipated to be at ground potential at all times and therefore safe on its own, due to this neutral line being ‘bonded’ to the physical earth ground. RCDs with three or more poles can be used on three-phase AC supplies (three current paths) or to disconnect an earth conductor as well, with four-pole RCDs used to interrupt three-phase + neutral supplies. Specially designed RCDs can also be used with both AC and DC power distribution systems. RCD’s don’t cover all possible fault conditions, so they cannot remove all risk of electric shock. In particular, an RCD alone will not detect overload conditions, phase-to-neutral short circuits or phase-to-phase short circuits. An RCD helps to protect against electric shock when current flows through a person from a phase (live / line / hot) to earth. It cannot protect against electric shock when current flows through a person from phase to neutral or from phase to phase, for example where a finger touches both live and neutral contacts in a light fitting; the device cannot differentiate between current flow through an intended load from flow through a person, though the RCD may still trip if the person is in contact with the ground (earth), as some current may still pass through the persons finger and body to earth.